Leasing a Copier? You Might Be Getting Ripped Off. Here’s Why. As a business owner or finance executive, you’re under constant pressure to cut costs and improve the efficiency of your operation. While many times this can entail tough decisions, sometimes with a little searching you can find opportunities that save you thousands without the need for any real sacrifices. If your company is like most, chances are you lease your office’s copiers. On the surface, this may seem like a good deal. But in reality, leasing a copier is convoluted, confusing, and filled with traps that dramatically (and unnecessarily) inflate your costs. The typical copier lease – also known as a Fair Market Value Lease (with no buyout) – is designed to look like the most affordable option, but in reality it costs you tens of thousands more per machine while providing negligible advantages over the alternatives. Read on below to see why. Copier leases can be distinguished by three primary factors: the rate factor (aka interest rate), the monthly payment, and what happens to the machine at the end of the lease. Fair Market Value (FMV) – No Buyout: lowest rate factor, lowest monthly payment. Copier is returned to the leasing company at the end of the lease term. 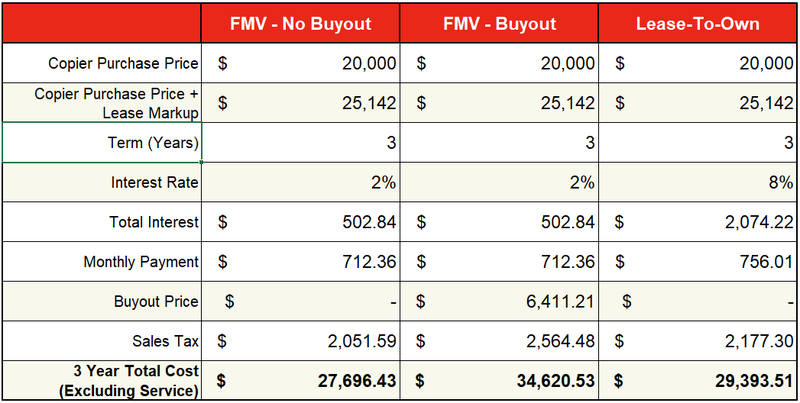 Fair Market Value (FMV) – Buyout: same rate factor and monthly payment as FMV – No Buyout. Lessee purchases the copier at Fair Market Value at the end of the term. Lease-To-Own (sometimes called $1 Buyout): higher rate factor and monthly payment than either FMV lease. Lessee owns the copier at the end of the term for no additional cost. Let’s take a look at an example to see how these different lease structures play out for a $20,000 copier leased with a 3 year term. Note: copier dealers usually add some sort of markup to the purchase price of the copier if you are leasing. This is denoted in the “Copier Purchase Price + Lease Markup” row. After looking at the chart above, it would appear that the FMV – No Buyout lease is the best value of the bunch. It has the lowest interest rate, the lowest monthly payment, and there’s no buyout price at the end of the lease. But what happens after the 3 year lease term is up? You still need a copier, right? This is where your copier dealer really makes their money. With both an FMV – Buyout Lease and a Lease-To-Own, you get to keep the copier at the end of the term (after any applicable buyouts and taxes). With an FMV – No Buyout Lease, you’re either upgrading to a new machine with your existing vendor, or you’re starting a new lease with another vendor. Either way, you lose the machine you just finished paying off and you have to sign into a new lease agreement and will be paying off yet another copier for the next 3-5 years. Does it really make sense to pay for a whole new copier after you just finished paying off the first? The prevailing mentality endorsed by copier dealers is that you need a new copier every 3 years. Most office copiers are rated by manufacturers to print about 1.2 million pages over their lifetime. As long as the machine is well maintained, it should be able to last at least 10 years. In our experience, most copiers coming off a 3 year lease will have only printed about 240,000 pages. With 80% of their useful life remaining, that means these are perfectly good copiers! With an FMV – No Buyout Lease, you’re essentially giving the leasing company a perfectly good, completely paid off copier with the majority of its residual value for free. In exchange, you get the opportunity to completely pay off yet another copier over the next 3 years. As you can imagine, over the long run, this gets very expensive. Let’s take a look at a 10 year comparison between these three methods of leasing using the same numbers from our previous example. 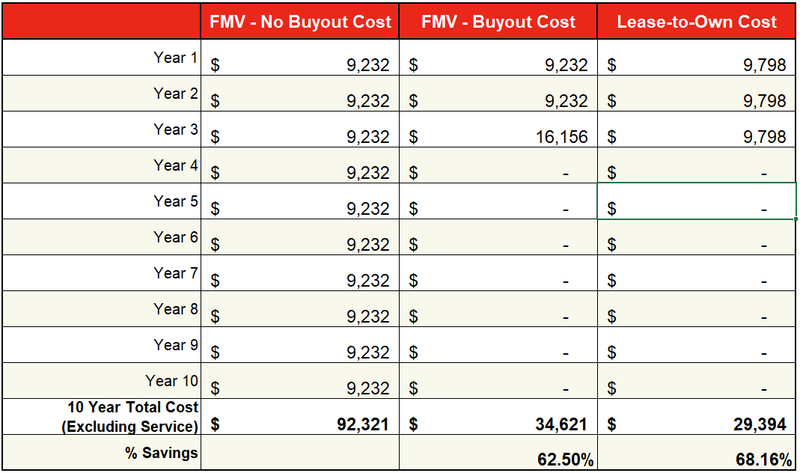 As you can see above, the FMV – No Buyout Lease is by far the most expensive of all the leases. In this example, going with a Lease-To-Own would save you roughly 68% over 10 years. The FMV – Buyout Lease may be an option, but it’s more expensive and requires you to pay a lump sum at the end of the lease. The only benefit would be a marginally smaller payment over the first two years. All things considered, if you’re going to lease a copier and want to most financially sound choice, go with Lease-To-Own. 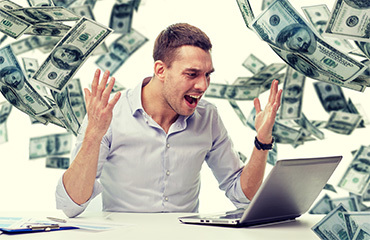 While the ability to upgrade your machine every 3 years may be nice, at the end of the day you have to ask yourself: is it really worth paying 3x more just for a few added bells and whistles?